Today, authenticity is credibility. Gone are the days where credibility wears a suit and tie. People believe and trust others they relate to; raw, scrappy, unedited, and vulnerable comes off as real, relatable, and true. The “always-polished” image, and over-rehearsed presentation style comes off as phony, fabricated and trying too hard. I mean come on, when was the last time you heard someone talk like that in your day-to-day life… never! Putting up a super-polished, perfectionist persona actually puts a barrier between you and your audience. Everyone knows that even the most successful people in the world aren’t perfect. So, when you try to emulate perfection, people’s B.S. meter goes through the roof. If they don’t trust you, they definitely won’t buy from you. Have you ever seen someone you know starting to build their personal brand, and they launch their website and it’s totally obvious that they are trying to be someone they aren’t. Well, as you may have also seen, it won’t take long for other people to figure it out either. As a personal brand, authenticity is one of your biggest assets and strongest differentiating factors. Many people think that just because there’s a big personal brand that is well-known on the topic or in the industry they are passionate about that they can’t build their brand in that industry. Or, if they try to build their brand there, they won’t be successful because “Someone else is already doing it”. Or, they have to act, dress, and talk like that leader in their industry in order to be successful. There are people in your industry that can’t stand that other big personal brand, and are floundering, looking for a leader and mentor they can resonate with and trust. Your authentic personal brand is what sets you apart. Don’t try to be somebody else. Be true to yourself, your skills, and your expertise. Authenticity in business is an invisible, but powerful force when used strategically. Authenticity is a mix of three main values (among many others). 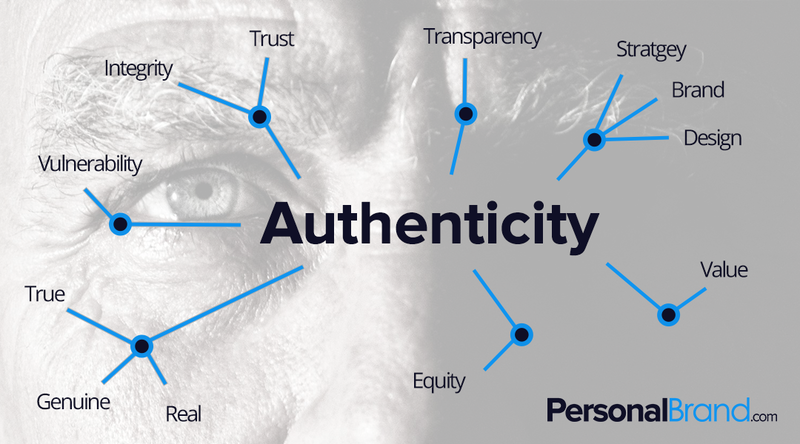 Those main values that make up authenticity are: Transparency, Vulnerability, and Integrity. One of the best, and easiest ways you can show authenticity when building your personal brand, is by learning to tell your story in a powerful way. Chris Smith, is a leading expert at brand development and story-telling, and has a bunch of great info on crafting your story. Being transparent about your path to success, and vulnerable about the struggle and hardship you encountered along the way, make you human and relatable. When used strategically and consistently throughout your content, brand messaging, and day-to-day interactions with people, authenticity is like a super-magnet pulling people to your brand. It’s important to note though, when it comes to transparency and vulnerability – more isn’t always better. You don’t want to be so vulnerable and transparent about every detail of your struggle that it turns people away. You don’t need to air out all of your dirty laundry in order to be seen as vulnerable and transparent. It’s important to find that balance. Know how vulnerable and transparent you need to be in order to make a connection with your audience. The other big piece is Integrity. Authenticity doesn’t exist without integrity. Authenticity is thrown out the window when people question your integrity. People want to do business with people who do what they say they will do, who care and have the right intentions, and are passionate about what they do. Every day, show up as your best-self, show up to help people, be unapologetically yourself, let your love for people, and what you do, shine through in every interaction you have. Start building your authentic personal brand one person at a time. 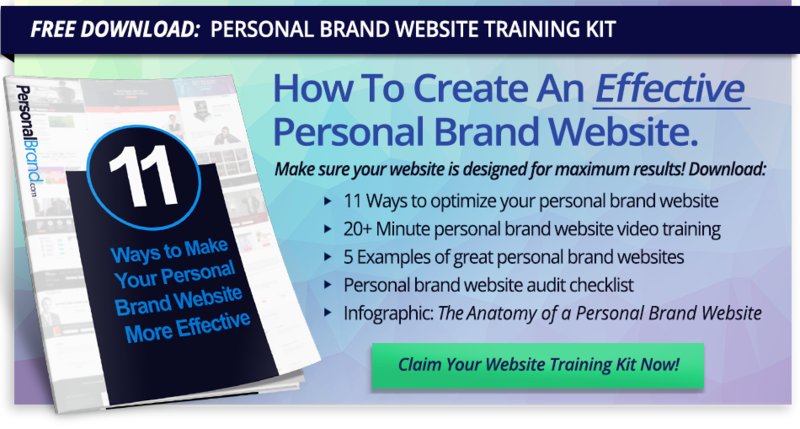 Join the Personal Brand Builders community and make sure you never miss our best stuff! You’ll get a monthly email with our latest content with tips, strategies and best practices to building a personal brand. Join the Personal Brand Builders community now!